Following is a short history of the Royal York & Faulkner Hotel, Sidmouth. The hotel first came into the Hook family in the 1930s, when it was virtually an unknown entity. More than 70 years later, the hotel is a thriving success, popular with both new and returning guests. In 1939, Freddie Hook and his wife, Violet, bought the Faulkner Hotel. Freddie, the son of a Thames lighter-man, had apprenticed in the kitchens of Sidmouth’s Victoria Hotel. From here he moved on to become the chef at the Fortfield Hotel where he cooked for the Duke of Connaught. Violet (née Hucker) was from an old Sidmouth family, who ran the nearby Huckers’ Luncheon Room. After acquiring the Faulkner, visitors were scarce as war was imminent. For the first few months, virtually no-one visited the hotel. On the outbreak of the Second World War, Freddie joined the RAF, (although extraordinarily he was posted back to the nearby Riviera Hotel, taking charge of catering for the Sergeants’ Mess). This left Violet to run the guesthouse while raising three young children. The hotel was the only hotel in Sidmouth not to be requisitioned during the war. After the war, the couple turned the Faulkner into a thriving hotel. They expanded into two more of the houses on York Terrace. At this point, their youngest son, Peter, joined the family business. In 1957, Peter met and married, Rosemary Fyffe from Dorking. In 1970 the Royal York Hotel, then owned by a group of local businessmen, came on the market and Peter and Rosemary expanded to form the Royal York & Faulkner Hotel, as it is known today. Freddie died in 1990 and Violet some years before. Today, the hotel continues to be successfully run by Peter and Rosemary with their children, Paul and Sara. In 1800, the area of the eastern promenade was still undeveloped rough land where, in the 18th century, ships had been built for coastal trades. It was here, on the corner site of Fore Street, opposite the Esplanade, that construction of Sidmouth’s first purpose-built hotel, the York, began in 1807. The concept of a hotel where people went to stay for extended periods was a new one in Regency times. The York Hotel, as it was then called, quickly became popular and was the town’s premiere establishment for more than 90 years. Lord Charles Wellesley, second son of the first Duke of Wellington, stayed at the York Hotel in the summer of 1854. However, the hotel’s most celebrated visitor was Edward, Prince of Wales – later Edward VII – who stayed in September 1856. As a result of this visit, the hotel could add ‘Royal’ to its name. When the Hook family bought the Royal York Hotel in 1970, the Royal York & Faulkner Hotel was created. Sidmouth had a modest start in Saxon and Roman times. It later became a subsidiary of the monastery at Otterton. The parish church was dedicated in 1259. The church we see today was restored in 1859/60. In 1322, ships and men from Sidmouth were sent to help Edward II’s national fleet, but when the River Sid became heavily silted, the harbour entrance was blocked and for a while the town became notorious for smuggling. Fishing continued to grow and became the major industry for many years. To this day, fishermen still ply their trade from the Ham. During the Napoleonic Wars of the early nineteenth century, the continent was closed to travellers. This meant big changes for Sidmouth. The gentry needed somewhere to holiday and Sidmouth’s development into an elegant Regency resort began. The Fortfield Terrace was built around 1795 and in the early nineteenth century, ‘Cottage Orne’ was built for the local gentry. The infant queen Victoria lived here between 1819 and 1820 in what is now the Royal Glen Hotel. In 1986, the two hills either side of the town were purchased by the Sid Vale Association and the National Trust to preserve them from development. In 1995, extensive sea-defence works were completed to save the town from the ever-encroaching sea. 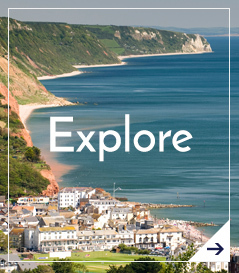 The unspoilt charm of Sidmouth has ensured it has always been a select destination with many top quality hotels lining the Esplanade. Sidmouth remains to this day an elegant seaside resort with a unique cultural heritage.